I am having the time of my fashion life checking out these monthly subscription boxes for my new wardrobe. This week is ALL about Gwynnie Bee! In my quest to build my RajdulariStyle brand, I was lamenting to my sistagirls about how I really wanted to keep enhancing my wardrobe and experimenting with different styles. Thankfully, one of my dear friends (and incredible stylist) Steffany Allen told me about Gwynnie Bee (thank you Steffy!). 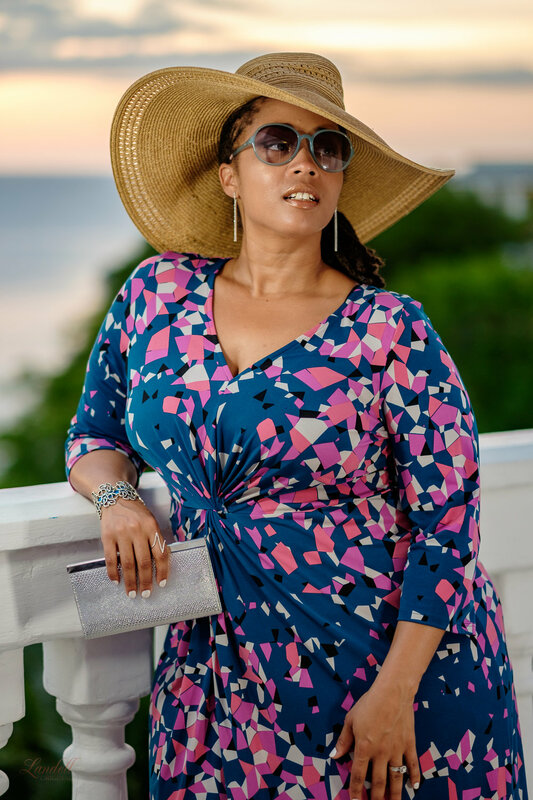 I quickly hopped on their site, added a few pieces to my 'closet' to start with, and was so happy that this beautiful Leota 'Charlotte' Prism dress arrived just in time for my Jamaica trip! This dress hugs the curves in ALL the right places, and I loved the bright blue, white and pink colors! You can NEVER go wrong with a great jersey dress. Especially this one with it's slimming twist-knot detail in the front, and the way it flatters the hips. I can see me rocking this dress for a long time. Miss Gwynnie, I see you girl. LOH-VING this as my first piece! Can't wait to see what arrives next month! Best part about this service, as opposed to others? You can actually view their offerings in advance and choose some of your favorite pieces to hang in your closet until it's time to ship. You keep the look as long as you want (instead of only having 5 days to decide like other services), and once you send it back? They send you whatever item is next in your 'closet' queue. I loved being able to choose what I want, instead of waiting to be surprised every month. So far, this subscription service idea is working out great, and I'm having fun playing in clothes and fashion. I can't wait to see what comes up next! Get details for this look, (and my accessories) below. See you next week, Fashionistas!